As previously mentioned, the rounded-out parties and networking opportunities at GDC Online include an Opening Night Party on October 6th sponsored by Unreal Engine creator Epic Games, plus on-site mixers from Hi5, Crytek, and a multitude of others. In addition, the four Summits taking place at GDC Online on October 5th and 6th have rounded out their session content, with new lectures in the iPhone Summit, iPad Summit, 3D Stereoscopic Gaming Summit and the Game Narrative Summit from notable companies such as Obsidian, Booyah, Supergiant Games, Smoking Gun Interactive, OneBigGame and more. Also rounded out are the full set of vendor-supported tutorials, open to all GDC Online pass holders excluding Game Career Seminar, having added specifics for the GameSpy-supported tutorial day, including a lecture called 'Tools for User Generated Content in Sid Meier's Civilization V', laying out "an introduction to the modding tools developed for Civilization V that players have used to create dynamic new content for the next generation of Civilization games." These final announcements join just-debuted talks with lessons from APB, Habbo and even Cow Clicker, with a full set of highlighted lectures including talks from KingsIsle, IMVU, Disney, Playdom, BioWare Austin, Hangout Industries, Broken Bulb Studios, CCP, Gaia Online, Playfish, InstantAction, Ubisoft and a host of other notable companies at the leading worldwide online game-specific conference. One of the other major advantages of attending GDC Online is the comprehensive list of nearly 100 exhibitors with whom attendees are able to get product demonstrations, meet, and interact on the vibrant GDC Online Expo Floor. These include major firms like Epic, Rackspace, Gaikai, Offerpal, Vindicia, Trinigy, ARIN, Versant, Rixty, Softlayer, and many other large companies in the space. 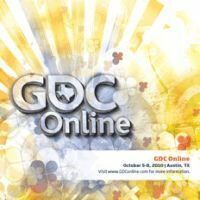 GDC Online is operated by the UBM TechWeb Game Network, and will take place October 5-8, 2010 at the Austin Convention Center in Austin, Texas. To learn more about lectures across all tracks and summits for the event, for which registration is still open, please visit GDC Online's official website.